Dry eye is characterized by many symptoms that can include (but are not limited to): eye irritation, soreness, pain, redness, grittiness, blurred or fluctuating vision or eye glass prescriptions, contact lens intolerance, eye fatigue, and sensitivity to light. Dry eye can be present at any age but becomes more common in older age. People who spend a lot of time outside, and/or on screens (telephone viewing, computers, television) can also suffer more frequently from Dry Eyes. Dry eye can be a chronic problem which can affect all aspects of vision, and therefore quality of life. TrueTear® is a revolutionary new dry eye treatment that works to temporarily increase natural tear production and relieve dry eye symptoms. 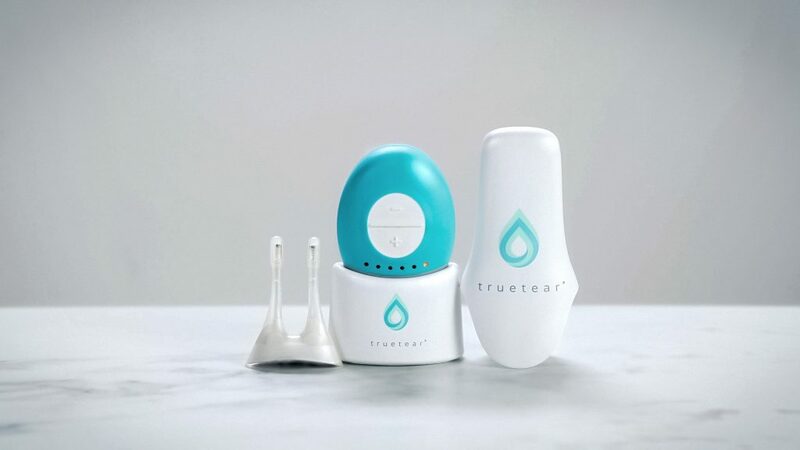 TrueTear® is a state-of-the-art device that is used to stimulate the production of natural tears through a process known as neurostimulation. The device is available by prescription only. The TrueTear® device is inserted into the nostrils, where it stimulates the trigeminal nerve and the seventh cranial nerve with electrical impulses. As a result, the lacrimal glands are stimulated to produce tears. Your doctor will teach you how to operate the TrueTear® device for self-treatment of dry eye syndrome. How often should I use TrueTear®? The device is designed to be used at least twice daily. There are 5 stimulation intensity levels that patients can adjust to their comfort level. Most patients begin use around level 2. TrueTear® can be uses from 30 seconds to 3 minutes at a time, but the maximum use is 30 minutes per 24 hours — the device will automatically shut off after this threshold is reached. How does it feel to use TrueTear®? Most patients experience a tingling sensation, and then are aware that tears are forming. It should not be painful. Patients who experience pain, discomfort, or a burning sensation should stop using the device and contact their eye doctor. Most patients in clinical trials experienced significant relief of dry eye symptoms. The device can be tried in the doctor’s office to ensure its effectiveness. Stimulation of tears is immediate. TrueTear® helps to relieve dry eye symptoms in patients who have trouble administering eye drops due to arthritis, poor vision, etc. Most patients prefer to self-treat dry eye symptoms at home, which provides the ability to control dosage and frequency based on symptom severity. Many patients have been able to reduce or eliminate the use of eyedrops for dry eye. TrueTear® can be used in conjunction with other dry eye treatments. The device is small and portable, enabling use outside the home and while traveling. If you experience any of these symptoms after using TrueTear®, discontinue use of the device and contact your eye doctor. Am I a candidate for TrueTear®? Only a physician can determine if you are a good candidate for TrueTear®. TrueTear® has been approved by the FDA for use in adults at least 22 years old. 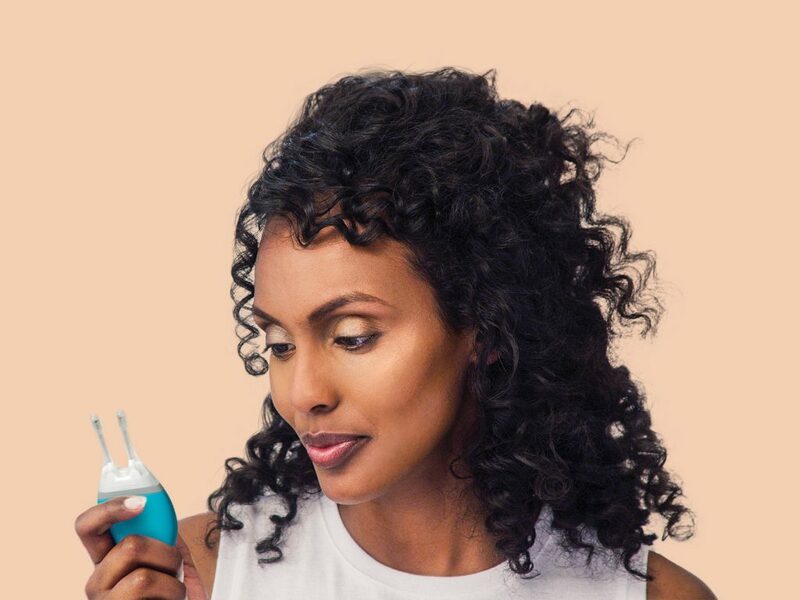 It should not be used by patients with a history of frequent nosebleeds, clotting disorders, pacemakers, implantable defibrillators, or other implantable devices in the head and neck. Dry eye syndrome is a common, treatable condition. The best way to find relief is to visit your doctor to discuss your symptoms and treatment options. Call us at (562) 799-2020 or schedule an appointment to meet with one of our dry eye specialists in Long Beach!